RIO DE JANEIRO, BRAZIL – Imagine feeling the cool sea breeze and watching the sun set against the backdrop of the soothing tones of a jazz trumpet. It will be reality this weekend during the Fifth Jazz Leblon Festival, not called Brazil’s most charming music festival for nothing. The event takes place in Leblon in Zona Sul (South zone) starting Saturday, May 14th at 2PM at Palco Dois Irmãos at the edge of Rua Dias Ferreira, and Sunday at the Palco Gentileza at the Orla do Leblon. Fino Coletivo, photo courtesy of Fino Coletivo. The free festival unites top musicians in jazz, blues and MPB and, for the first time this year: the theme of wellness. 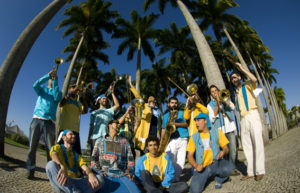 In terms of audience, Leblon Jazz is considered the largest jazz festival in Brazil. Last year it attracted over 20,000 visitors. The festival’s organization also aim to inform its visitors about consumer awareness and sustainability. Last year they distributed 5,000 shopping bags made from recycled material. New during this year’s edition is the Beach House, which is made of eucalyptus and from 10AM on will be converted into a beach spa. Visitors are offered free wellness activities such as yoga and meditation. But in the afternoon, the Beach House heats up to all kinds of rhythms and becomes a concert stage. Rio is the City of Samba and often it seems to have less to offer fans of jazz music. There are some venues that feature it, like the monthly jazz night at The Maze in Catete, or jazz club TribOz in old Lapa, but for the most part Rio lacks regular venues for jazz musicians. Recently the Festival de Jazz do Rio de Janeiro (Rio Jazz Festival), which ran during the month of January, has also launched and had a successful second year. Another event is the Rio das Ostras Jazz & Blues Festival, which has been held in the small town of Rio das Ostras in northern Rio state for the past eight years. Orquestra Voadora, photo by Tiago Facina. Closing the event on Sunday evening is Fino Coletivo, a group of musicians from Alagoas and Rio who combine originality with and authentic sound: samba with groove and soul. Mhh, this was such a nice music!